It is necessary to clean the firearms regularly for its effective functioning. Every single time trigger is pulled, a tiny explosion occurs in its chamber. This leaves sediments or unwanted residue inside a gun barrel. Therefore it becomes prudent to inspect it properly and give it a thorough cleaning to avoid unnecessary mishaps. 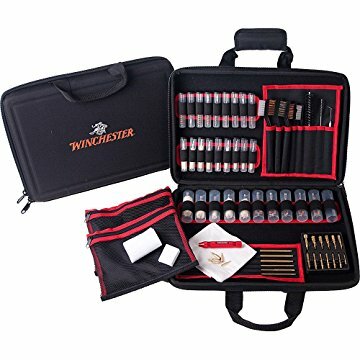 Best gun cleaning kit becomes a necessity for a Gun enthusiast as it helps in proper and systematic process of cleaning. Hoppe’s Universal Gun Cleaning Accessory Kit is a quality product belonging to brand Hoppe. It serves its purpose beautifully by providing a methodical cleaning with help of its product kit. Brand has successfully tested its product in rough weather and tough conditions. Accessory kit has been designed for recreational users and professionals. It is suitable for cleaning both pistol and shotguns. The accessory kit comes with a cleaning rod made from aluminium that helps in keeping firearms in good condition. There are also nine brushes of phosphor-bronze included; these nine brushes can be used for cleaning firearms of calibres .44/.45mm, .40/10 mm and .357/9mm. The brushes exquisitely remove entire dirt without harming the firearm; these brushes are designed so meticulously that they don’t even leave scratches. Some of the other items included in the accessory kit includes of 5 swabs for polishing its barrel and eliminating loose residue. There are 4 slotted-ends that can be replaced according to the need and the overall dimension of the product comes around 14X7X3 with the total wieght of 1.8 pounds. Belonging to brand Outers this cleaning kit comes in an attractive box of oak-finishing giving it a classic look. 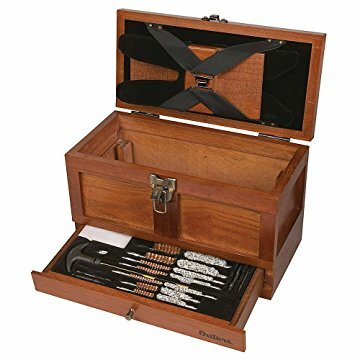 Wooden box includes 28 items that works as cleaning gear for a variety of firearms, especially of .22 calibres. 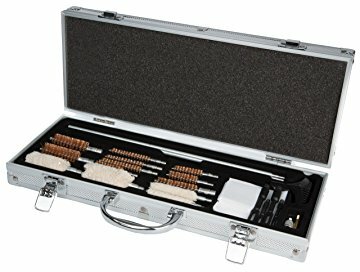 It is a perfect fit for keeping all tools organized. 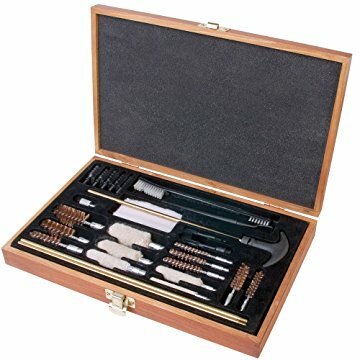 The product kit of wood gun cleaning box includes of three premium rods of solid brass. The entire dimensions of this product are 11.9*8.8*1.8 inches and weighs 2 pounds. There are double loops of patching and eight distinct brushes of bronze material. The five jags provide in the kit are used for cleaning purposes. The varied types of mops provided can be used for absorbing the unwanted moisture. There are at least 50 patches for cleaning along with one cleaning pack. The kit includes of an adaptor that can be used for powering the tool. Out of the several brushes, included one of them is made up of nylon and the kit also consists of reliable chemicals for cleaning purposes. Brand Cold Steel decided to elevate its bar with Cold Steel 2 pc Big Bore .625 Magnum 5-Foot Blowgun. This is a masterpiece that has been created with lots of efforts and quality materials. The features of Brand Cold steel are not just impressive but very useful as well. Some of the features have left engineers and users awestruck. The general thickness of the barrel is somewhere near 3mm; when compared to similar products; it is at least 4% heavier, which makes it one of the heaviest blowguns in the business. The accuracy level is going to blow the minds of engineers and the distinct users. 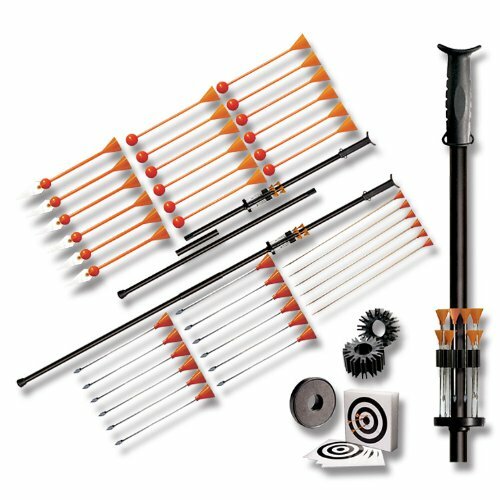 The kit includes of 36 varied types of darts; the gun is designed for blowing dust and items up to a distance, this specific gun can blow dirt up to 20 yards. The magnum 5-foot Blowgun is available a wide range of colors. The guns are twin-piece in design and look very impressive. The thickness of the walls of the gun is around 1.5mm; there are rubber ferrule, which increases the efficiency of the gun. The gun is known to include coupling tube and threaded joints. The lightweight of around 1.4 pounds allow people to carry it with great ease. There are four unique product that comes in kit, mouthpiece, quiver guard and dart quiver are few of them. the material used for manufacturing of these guns are similar to the ones used for the manufacturing of aircrafts. One must take ample time to unload a gun. Check and then recheck before cleaning it. Open the gun chamber and look thoroughly from front to back and vice-versa through barrel. It is vital to confirm absence of ammunition inside a barrel or chamber. It is necessary to go through user manual to follow all instructions carefully before disassembling a firearm. One must not be overenthusiastic, instead must gain access to those parts that are dirty and require cleaning. Some firearms cannot be stripped off and they can be easily cleaned by removing their chamber. Some firearms like rifles and semi-auto pistols need to be field stripped into their components like magazine, frame, guide rod, slide and barrel. Lubricant used for cleaning purposes has a foul smell and can cause uneasiness in a closed space. It is important to spread out newspaper or old sheet or towel on work surface before cleaning to avoid dirt and grime. In order to clean a barrel take a solvent-soaked patch and push it inside until it comes out from other end. Remove it from other end as pulling it back will redeposit the dirt. Now push the bore brush along the barrel to loosen any residue. Now again push the solvent-soaked fabric inside and remove it from other end. This will clean the barrel thoroughly. Take a flannel fabric coated with silicon-lubricant and get rid of remaining residue or debris. Why is it vital to clean a gun? Why is it necessary to clean a firearm in a well-ventilated area? Why is lubricant necessary for cleaning a gun? Firearms must be kept in their proper cases to avoid unnecessary accidents. These are hazardous product and hence must be kept safely. People are very serious and passionate about cleaning and maintenance of their firearms and for this purpose they try to buy best available cleaning products. Regular cleaning will prevent rust and provide better performance in upcoming years. Previous ArticleHow To Clean A Rifle Scope Properly? Next Article Air rifle – Which one is right for you?